Review: London label Spinning Plates has been doing some very interesting things over the past few years, just popping up occasionally to drop some on-point leftfield minimal grooves from lesser known names. 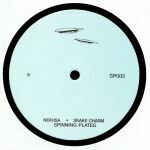 The intrigue continues with the fifth release on the label, which features a return appearance from Nekhsa and a longform appearance from Snake Charm. Nekhsa's A side slides between skippy beat excursions, inventive acid electro funk and the reduced ghetto house pump of "Look at dads new sl..." Meanwhile Snake Charm stretches things out with the bubbling, trippy "119.94 Lock," which makes full use of an extended run time to patiently weave FX sends and subtle textures around an insistent, ultra-minimal beat. Review: The fourth installment on Spinning Plates comes from Andy Rantzen and Laccy, featuring a wealth of off-beat techno adventures for wayward souls. Rantzen is an Australian producer with a history remixing the likes of Severed Heads and working alongside Paul Mac as Itch-E & Scratch-E. His lead track "Digital Elf" is a stripped a raw beats n' bleeps workout, while "The Dial" finds Mac chipping in as they rework the track into a deadly old-skool burner for lovers of bleep techno. Laccy has only had one prior outing to date, but sounds in strong form on the sleek and crafty "Spectrum Of Vibrations" and delightfully freaky "Coincidence Of Opposites".